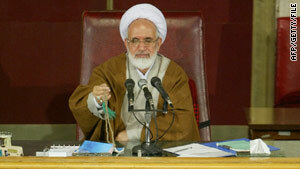 In this file image from April 2004 Mehdi Karrubi is pictured during his tenure as speaker of the Iranian parliament. Tehran, Iran (CNN) -- Iranian opposition leader Mehdi Karrubi's car came under fire, a reformist Web site reported Friday. The incident occurred in the northern town of Qazvin. Only the windows were damaged, said Parleman News, which is run by reformists in the Iranian parliament. Karrubi was invited by a former parliament member to attend mourning ceremonies in Qazvin, where he was met by people protesting his presence, the semi-official Fars News Agency said. It was not immediately clear whom the mourning ceremonies were for. Karrubi and opposition leader Mir Houssein Moussavi challenged President Mahmoud Ahmadinejad in last June's election, in which the hardline incumbent was declared the overwhelming winner. Ahmadinejad's re-election triggered a wave of demonstrations and turmoil on the streets of Iranian cities.